A couple of weekends ago, a classmate and I decided to meet at Tryst on a Sunday afternoon. We could lay out our books and notes, we thought, sip some lattes, and spend a few hours chipping away at the assignment at hand. We arrived at Tryst only to see a roiling crowd of bodies squished onto couches and sitting hip to hip at tables (nothing like the above idyllic scene from Wikipedia). It would have taken a few hours just to get a seat. We watched, hawk-like, for long minutes. “Well, they have a great tea selection…” I heard a guy say, hopefully and weakly and a bit apologetically, to the woman accompanying him. There was no clear line, and other more skilled hunters swooped in to grab empty seats. They seemed to have a sixth sense that picked up on the slightest thought of leaving–maybe a glance toward a coat or a foot moving in preparation to stand. I tried hard to develop the sense, to scan the room and understand the difference between a motion to adjust the angle of a laptop screen and a move to get up and vacate a precious space. I concentrated until my shoulders got tight and my jaw went slack, and I think I twitched. After a while, we gave in and went to Starbucks. Which was also too crowded. 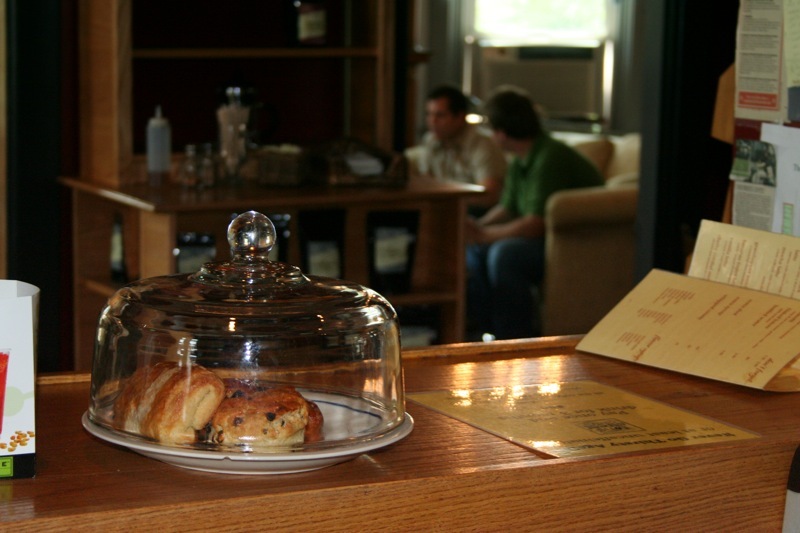 Why is the crowded coffee house a desirable place to be? And why are popular coffee houses so popular? Are the young and thirsty trying to get away from group houses with their myriad distractions? Or trying to avoid being distractions themselves? Or escape some kind of domestic tension? Somehow, I don’t think having dozens of coffee house patrons yammering around you and bumping into you is anything other than a diversion or a stressor. I’m stressed just writing about it. To top it all off, at some point in that jarring world, you have to use the facilities. No one really brings this up when they talk gushingly about these places, and I doubt anyone could explain to me the appropriate and safe thing to do. The bathroom moment is the terrible point at which you have to weigh whether saying goodbye to your new Mac that holds half of the next great American novel and 10,000 downloaded songs is really worth avoiding a bladder infection. I’d much rather be at home, on the plush sofa that we used to fight over when we stayed at my grandparents’ place, sipping my own tea–for free, with a personal restroom steps away. When my classmate and I did find a more sparsely populated place (thank you, Sticky Fingers! ), we did finally relax and get down to business. But I noticed that the guy next to us, after a few minutes of our discussion of character development and narrative tension, had clamped on a set of headphones and turned a few degrees away from us. I admit that since moving to a neighborhood with coffee shops within walking distance, I have occasionally written and studied in them. But each of my outings was a naked attempt to look cool and normal, and see if there was a point at which I’d actually become those things. So I was up for the idea of meeting someone at Tryst. I wasn’t totally against the place — I’d had a warm chat with close friends there a few months before and even went on a really good first date there once. * Maybe this would be the gestalt moment, when the clouds parted and a confetti of normalcy and sauvity fluttered down upon my head. I had often wondered how it would feel when–or if–that moment came. Like I said, we did relax. We did have a pretty good time and sip pretty good fair trade coffee and eat a yummy vegan pecan cookie. We did make progress on the project. But I haven’t felt the urge to run to Tryst or Teaism or Busboys and Poets–or even Sticky Fingers–on a weekend afternoon or a weekday evening any more than I used to. Don’t hold your breath trying to spot me wearing trendy clothes and just reading away on a couch, oblivious of the 20 people hovering, never bothered by the noise and never having to pee. And Tryst turns of the Internet all weekend too! I can understand on a Saturday night or whenever you were there, they’re happy to not have people camp out all day to use their connection. But when I showed up on a Sunday evening, placed an order, only to find that there was no WiFi. And the obnoxious message you get when you try to log in is something to the effect of “Relax! It’s the weekend! Get away from your computer and spend time with friends.” I’ll go online late on Sunday night if I want to, thank you very much. Luckilly I was able to cancel my order in time. I know! You’d think the lack of WiFi would convince people to hurry along after the 14th African berry zinger. But no… alas. Maybe that’s why they keep it off Sunday nights, even though it’s sick and wrong. Coffee shops are much better when they’re not crowded, but still the whole “scene” gets pretty hollow. Affected intellectualism/hipness/artistic temperament. It’s much better to visit out of a love for the actual coffee, or tea, or even the ambiance. On the subject, Starbucks coffee has actually been pretty inferior for awhile–even to other chains’ like Dunkin’ Donuts and Sheetz. What’s up with that?